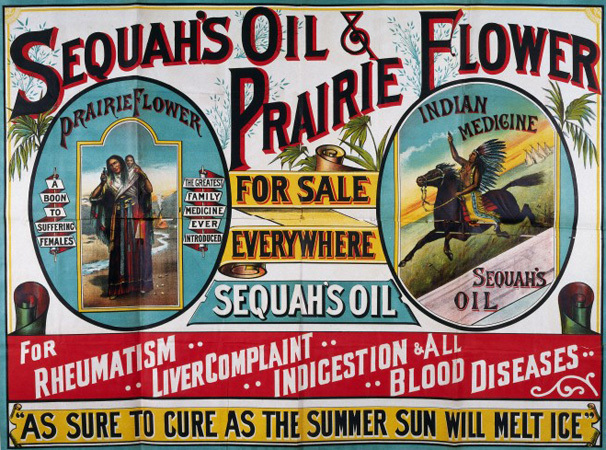 Few patent medicine advertising campaigns could have been as quirky as that of the Sequah Medicine Company. A browse through the late 19th century issues of the Chemist and Druggist journal traces the rise and fall of the Sequah business. Advertisement for Sequah’s Oil and Prairie Flower, ca. 1890. Wellcome Library reference: GC/69. Yorkshireman William Henry Hartley first adopted a long-haired Native American prairie persona to help promote his products in 1887. At the time, he was described as being akin to the “Last of the Mohicans“. He derived his brand name from a Cherokee called Sequoyah. Hartley claimed to use traditional Native American recipes in his wonder products: Prairie Flower and Sequah’s Oil. 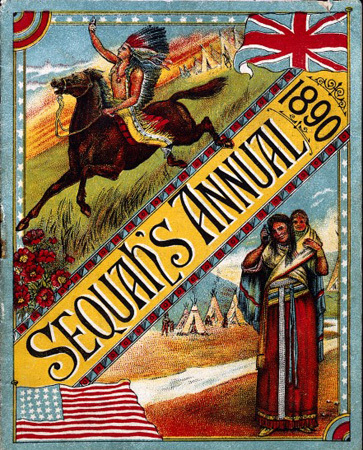 Front cover of Sequah’s Annual, 1890. Wellcome Library reference: GC/69. In January 1889, the Chemist and Druggist reported that “The prairie Flower, which was beginning to droop is now flourishing again in almost pristine vigour” thanks to an illustrated almanac that Sequah was “lavishing around Dublin”. Sequah’s Annual, as the almanac was known, was published as a weekly penny newspaper from October 1889 and contained advertisements, jokes and short stories intended to help sell more products. It was successful in “setting forth the ‘priceless value’ of his medicines”. Just in case anyone was in any doubt as to who Sequah was, a publication – Sequah, Who and What is Sequah? – emerged to explain the branding. Such was the success of the products that in November 1889, Sequah used the Chemist and Druggist to issue a warning to other traders trying to imitate his products. Sequah’s travelling show was another form of advertising. Accompanied by a brass band and fellow feathered ‘American Indians’, Sequah wore a gold chain, a head-torch and brandished the tools of his dubious trade atop a horse-drawn “golden chariot” illuminated by flares.With free products handed out to those who could prove their poverty, not surprisingly word spread rapidly. In February 1890 the Chemist and Druggist reported that musicians paraded the streets of Cork liberally distributing handfuls of small silver to “the gamins”, which ensured the company had a “a right hearty welcome”. 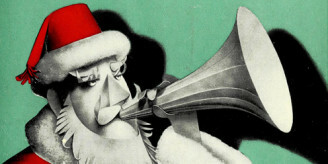 The show – performed after dark for maximum drama – toured Great Britain, Ireland, the West Indies, North America and South Africa. The so-called natural products were used in demonstrations of speedy tooth extraction, in miraculous massages for rheumatism and sometimes in séances. These performances were a hit with the entertainment-loving public: Sequah became one of the most successful patent medicine businesses in Britain during the late 19th century. It was claimed that Harley’s patients had dispensed with “many crutches and thick sticks” following treatment. With the patients recovered, he put the crutches and sticks to good use as a boundary fence around his extensive farm, or so he told his Leeds audience in November 1889. This show allegedly drew a crowd of 30,000. On arrival at Glasgow for business the same year, Sequah hoardings were “resplendent” according to The Chemist & Druggist. Announcement for Sequah’s arrival in Glasgow, the Chemist and Druggist, 26 January 1889. The Sequah shows became so popular that duplicate travelling salesmen (known as ‘Sequahs’) were employed to help to take the business further afield. By 1890, when a fairground steam organ was added to the attraction, there were 23 ‘Sequahs’ in operation. Peter Alexander Gordon went by the pseudonym of James Kaspar selling Sequah’s patent medicine globally according to evidence of his trade held at the Wellcome Library (Library reference: GC/69/2/F/1). So what was all the fuss about? Prairie Flower, said to be “a boon to suffering females”, was a form of tonic with a kick containing a weak alkali, a vegetable extract and a small quantity of alcohol. A smattering of capsicum pepper gave it its hot flavour. Sequah’s Oil was essentially a warming massage balm and contained the natural oil of camphor (a stimulant). It claimed to cure “rheumatism, liver complaint, indigestion and all blood diseases”. Both products were apparently “as sure to cure as the summer sun will melt ice”. By 1897 Sequah’s products were exposed as quackery. The botanic extract found in Prairie Flower was found to have originated in the West and East Indies, not North America. Neither was there anything new in the pharmaceutical administration of ‘aloes’ used in his products. Claims that there was something ‘fishy’ about Sequah oil proved true: the base oil turned out to be a cheap fish oil (apparently whale) that was mixed with turpentine and camphor. Also, there was a deceitful reason for the accompanying drum and brass bands at the medicine shows: the music drowned out the cries of pain from those gullible enough to step up to have teeth extracted. The UK government declared the practice of selling patent medicines in such a fashion illegal. 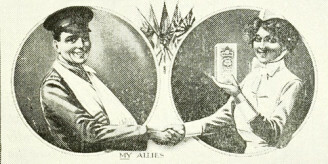 With sales peaking 1.49 million alone for the Prairie Flower remedy, the company came under the scrutiny of the Inland Revenue for stamp duty in 1890. The company went into liquidation in 1895 and was dissolved on March 26, 1909. Along with a considerable amount of archived material on Sequah at the Library, the recently digitised Chemist and Druggist journal provide a rich mine of information on the rise and fall of Sequah.